A new research has contradicted the idea that exercise is more important than diet in the fight against obesity. A study of the Hadza tribe, who still exist as hunter gatherers, suggests the amount of calories we need is a fixed human characteristic. This suggests Westerners are growing obese through over-eating rather than having inactive lifestyles, say scientists. One in 10 people will be obese by 2015. And, nearly one in three of the worldwide population is expected to be overweight, according to figures from the World Health Organization. The Western lifestyle is thought to be largely to blame for the obesity “epidemic”. Various factors are involved, including processed foods high in sugar and fat, large portion sizes, and a sedentary lifestyle where cars and machines do most of the daily physical work. The relative balance of overeating to lack of exercise is a matter of debate, however. Some experts have proposed that our need for calories has dropped drastically since the industrial revolution, and this is a bigger risk factor for obesity than changes in diet. The study, published in the PLoS ONE journal, tested the theory, by looking at energy expenditure in the Hadza tribe of Tanzania. 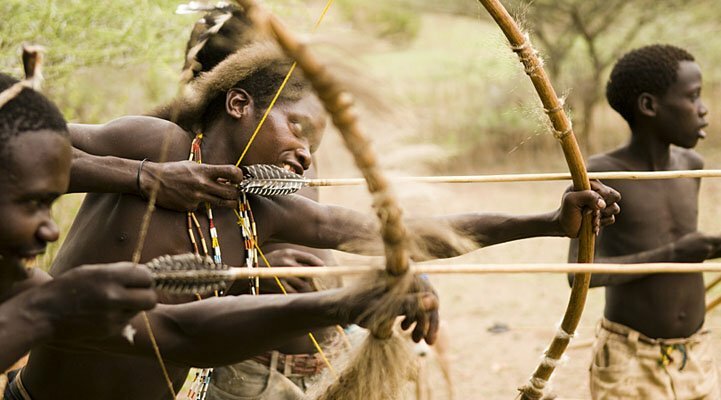 The Hadza people, who still live as hunter gatherers, were used as a model of the ancient human lifestyle. Members of the 1,000-strong population hunt animals and forage for berries, roots and fruit on foot, using bows, small axes, and digging sticks. They don’t use modern tools or guns. A team of scientists from the US, Tanzania and the UK, measured energy expenditure in 30 Hadza men and women aged between 18 and 75. They found physical activity levels were much higher in the Hadza men and women, but when corrected for size and weight, their metabolic rate was no different to that of Westerners. Dr. Herman Pontzer of the department of anthropology at Hunter College, New York, said everyone had assumed that hunter gatherers would burn hundreds more calories a day than adults in the US and Europe. The data came as a surprise, he said, highlighting the complexity of energy expenditure. But he stressed that physical exercise is nonetheless important for maintaining good health. “This to me says that the big reason that Westerners are getting fat is because we eat too much – it’s not because we exercise too little,” said Dr. Herman Pontzer. “Being active is really important to your health but it won’t keep you thin – we need to eat less to do that.